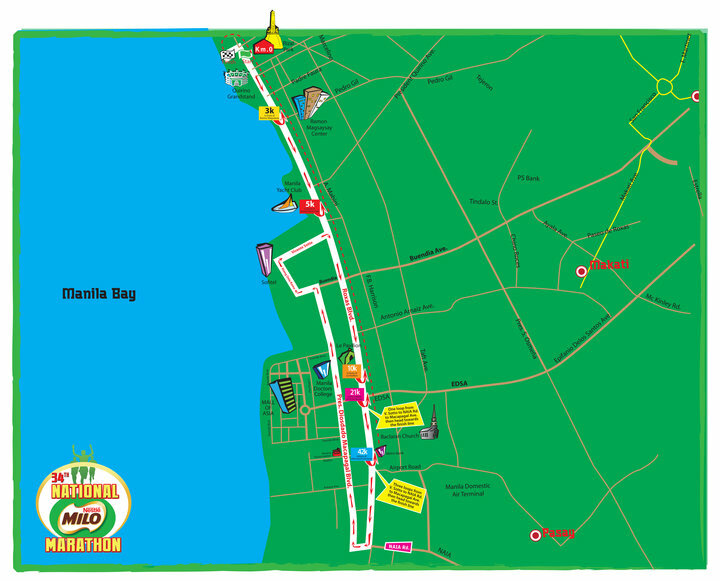 After I found out that the 34th MILO Marathon Elimination Route was changed into a different route where the 42K runners will have to undergo a 3-loop run within the course, I planned to recon the place, most especially that portion of the race route. At 7:30 AM, last Sunday, I started my run at a certain point within the loop course which have a direct access to the MOA grounds and located along the Pres. Macapagal Avenue. From this point, I went westward towards the PICC Complex by turning left going to the old and abandoned Film Academy Building; turning right towards infront of the Philippine Plaza Hotel and went all the way to the Folk Arts Theater before turning right towards Roxas Boulevard. I turned right at Roxas Blvd and did not dare to run along the flyovers at Gil Puyat/Buendia Blvd and EDSA but instead ran along the flat road of Roxas Blvd. Running along Roxas Blvd gives you the tendency to run fast while inhaling the smoke from all forms of vehicle passing the area; smell of garbage & drainage; and the dust of the road. I turned right at the Aguinaldo Blvd (Airport Road) before finally turning right at the Pres. Macapagal Avenue and ending my run where I started along the said road. My GF 305 registered a distance of 10.4 kilometers with an elapsed time of 1:01:32 hours and an average pace of 5:55 mpk! I have nothing to complain about the 3 loops every runner for the 42K race would undertake as long as it will result to an accurate distance for the 42.195K race. The relatively flat terrain of the course where the Flyovers will be considered as “speed bumps” (on flat streets) will be an advantage for the runners. For those who will be supported with their own family/friends’ Aid Stations, they could select a place where they could wait for their runner to pass without having the problem of following or “leap-frogging” with their runner. This loop system will also a nice way to keep an “eye contact” or good sighting to your “target” for this race due to the straight direction of the key roads of the route. I’ll be glad that runners within my age range will also use me as their “target”! But for the younger runners, I’ll be happy to see them way in front of me because they will be qualifying for a faster time! In my race strategy for this event, I’ll have to visualize that I’ll be running along the oval track with each lap measuring to 11-12 kilometers per lap, instead of 400 meters. I should be able to complete each loop in 1:10 hours or less and finish the remaining kilometers in 40 minutes or less in order to be able to qualify for the MILO Marathon Finals and register a Finish Time of 4:10 hours or less. This could be my most conservative strategy for the race but depending on the actual situation, my body condition, and external factors, I could go for a faster time. Having prepared for this race since the last week of March 2010 and my training in the mountains had given me the confidence of a nice result for this race. Despite my long runs had been within the range of 25-30 kilometers, I tried to compensate the need for longer LSDs by training along the mountain trails and “sharpen” my training through hill workouts. Another bold experiment that I’ve done for the past months is the ability to sustain my pace without drinking any water or sports drinks on my 10K or less distance workouts. I tested and evaluated this experiment when I participated in the latest NB Trail Adventure 15K Run at Nuvali, Sta. Rosa, Laguna last June 20, 2010. It did not affect me whether the Water Stations were not consistently positioned along the route. I’ll be using the MILO singlet provided for this race; running shorts (“RMWRS!”); DryMax Socks; ASICS Gel-Tarther Shoes; Oakley Sunglass; and my Bandanas! Always remember, when you run the MILO Marathon Race, you have to give justice to this event as the “most prestigious marathon race” in the country. Do your best and prove to yourself and to everybody that you are a “RUNNER”! See you this Sunday! Good luck! You Will Never Miss Me During The Race! Wow. 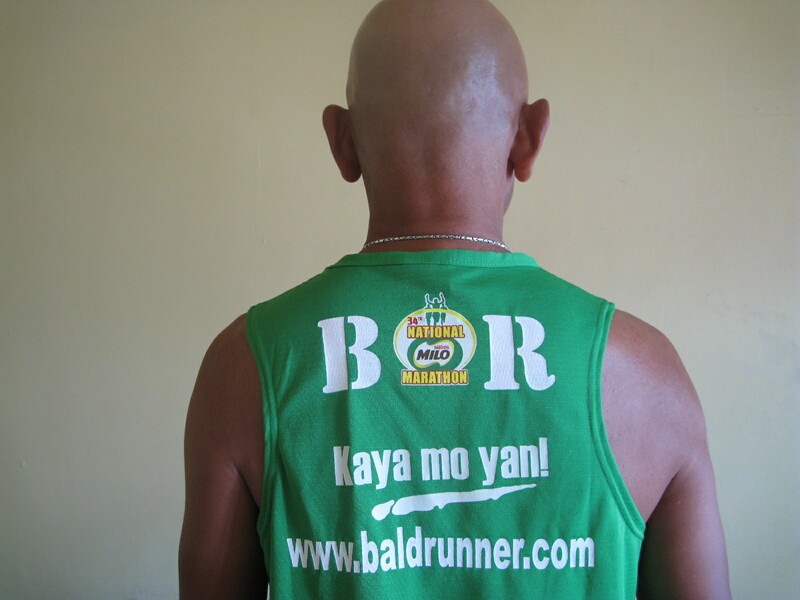 A personalized MILO running shirt! See you on Sunday! Hi Sir Jovie. Hopefully, the runners won’t complain about the three loop course as long as it’s certified. Back a few years ago, I ran a marathon down in San Mateo (near SFO Airport) that was five loops with the finish at a high school track. It was the country’s National Championships and was certified by what was then the AAU (now USA Track And Field). This was in 1973 before marathoning took off all over the world but nearly 500 runners finished. Good luck, BR! My conservative prediction is, you will cross the finish line under 4 hours. Just don’t forget your Pangasinan suman or, better yet take the patupat. nice, personalized singlets! see you sir on sunday! Sir! I like your singlet! Really!! just for the Milo Marathon.? Neat!! hehe.. Idol Sir Jovie. Nice personalized singlet and the shoes!!! Hope to really see you out there with the sea of green crowd! Good day!Sir jovie I see you in the race I know na di mo ko kilala.Ang hirap ng ruta pero kasama sa challenge yun di ba.pero ang di ko matanggap yung marshall o mga traffic enforcer doon sa bandang Moa.na pinatigil ako at isa pang runner to give way sa mga sasakyan I lost may concentration sa race kasi ng cramps mga paa ko di ako nakatakbo matapos mahinto sayang maganda na sana ang time ko ng mga oras na yun at last 11 or 12 k na lang yata yun (last round) with 1:20 time left sa relo ko sana nakapasok seguro ako ,bad luck! next time na lang ulit. 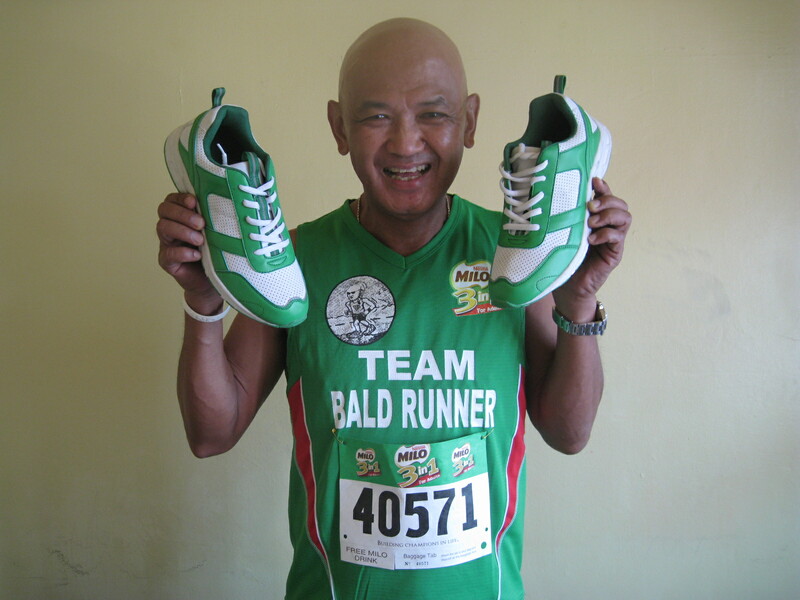 Sir jovie baka pwede rin akong maging member ng 1000k club mo kasi seguro mahigit na ang natakbo ko halos kasabay ko pa ang isa sa mga runner mo (rey antoque) at baka pwede ring makahingi ng sapatos sa iyo sir yung ginagamit ko kasi medyo di na pantay at sa mahal ng sapatos ngayon mahirap bumili lalo’t may mga pinapag-aral din naman ako.salamat sir.